Perhaps we were too quick to report about the situation regarding Egyptian museums and antiquities in January because conflicting updates have been coming out of Cairo and environs nearly every day. “I am leaving because of a variety of important reasons. The first reason is that, during the Revolution of January 25th, the Egyptian Army protected our heritage sites and the Egyptian Museum in Cairo. However, in the last 10 days the army has left these posts because it has other tasks to do. The group now in charge of the protection of these sites is the Tourist Police, but there are no Tourist Police to do this either. Therefore, what happens? 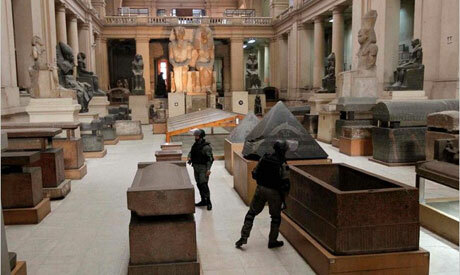 Egyptian criminals, thieves (you know, in every revolution bad people always appear…), have begun to destroy tombs. They damaged the tomb of Hetep-ka at Saqqara, the tomb of Petah-Shepses at Abu Sir and the tomb of a person called Em-pi at Giza. They attacked a storage magazine at Saqqara and we do not yet know how many artifacts are missing; they opened two storage magazines at Giza; one tomb dated to the 19th Dynasty, the only one in the Delta in fact, was damaged at Ismaïlia; and a store at El-Qantara East has been broken into and looted for antiquities. People have begun to build houses and to excavate at night, everywhere, putting heritage sites all over the country at risk. In any case, Mubarak’ replacement, Essam Sharaf, has asked the army to become caretakers of the valuable sites to protect Egypt’s cultural heritage. For now, some are starting to speculate if the only protection left for Egyptian antiquities is the mummies curse.